Located in the progressive city of Leander, Travisso, a master-planned community, is just 30 minutes from Downtown Austin. 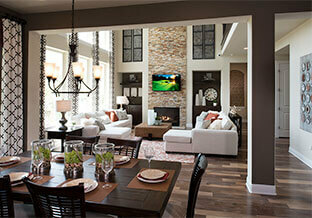 Check out the new Travisso homes available now through April, and be a part of hill country living. 3521 Venezia View (Julliard floor plan), 3,217 square feet, two-story residence, four bedrooms, three and a half baths, and a three-car garage. This home features a master bedroom on the first floor, with bedrooms and game room on the second. Ready for immediate occupancy. 3613 Venezia View (Rockhurst floor plan), 3,306 square feet, two-story residence, four bedrooms, three baths, two-car garage. This home features plenty of space to work or unwind, with a study downstairs, and a game room with bonus media room upstairs. Ready for immediate occupancy. 2409 Parisio Court (Oakbrook floor plan), 4,572 square feet, two-story residence, five bedrooms, four and a half baths, and a three-car garage. This home is an organizer’s dream with walk-in closets in each room and a family ready room that includes loads of cabinets and an optional center island and dog wash. Ready for immediate occupancy. 4129 Vespa Cove (Plan 553-AS), 2,240 square feet, one-story residence, four bedrooms, two baths, and two-car garage. This gorgeous home has a kitchen/dining/family room combination ideal for large social gatherings or small intimate parties. An optional outdoor living space is available. Ready for immediate occupancy. 4216 Vespa Cove (Magnolia C), 1,969 square feet, one-story residence, three bedrooms, two baths, and a two-car garage. The Taylor Morrison Magnolia gives you affordable luxury in the Texas Hill Country. And not just that, you can personalize this home with several options available. Ready for immediate occupancy. 4129 Novella Cove (Madera E), 2,016 square feet, one-story residence, three bedrooms, two baths, and one-car garage. Madera’s master’s suite is truly a private retreat with a foyer-style entry leading to the room that includes a spa-style bathroom with soaking tub and separate walk-in shower. Options available. Ready in April. 3221 Venezia View (Monarch C), 2,915 square feet, one-story residence, three bedrooms, three bathrooms, two-car garage. Monarch plans offer open living spaces, including an enticing kitchen that opens fully to the living room. Each home has a covered patio with the option to add an outdoor kitchen and fireplace. Ready in April. 1732 Antica Place (Bevington C), 3,745 square feet, two story residence, four bedrooms, three and a half baths, three-car garage.This is one of the most luxurious homes at Travisso. With a grand entrance, two-story ceilings, gourmet kitchen, and elegant master-suite, this home could easily be confused for a castle. Bevington has options for more living and utility space, like a wine room! Ready in April. 4400 Sandorna View (Torino C), 3,587 square feet, one-story residence, four bedrooms, three and a half baths, and three-car garage. Torino offers you your very own courtyard entrance to enter the home. Walk through the portico into an expansive courtyard with optional outdoor corner fireplace.Ready for immediate occupancy. 4320 Westino Way (Maltese Bordeaux), 4,596 square feet, two-story residence, four bedrooms, four and a half bathrooms, three-car garage. Open concept design, natural lighting, and hill country views await you at this home. Ready for immediate occupancy. 2221 Fossetta View (Maltese High Plains), 4,868 square feet, two-story residence, five bedrooms, four and a half bathrooms, three-car garage. This home offers gorgeous Hill Country views from the covered porches on the first and second floors. There are also high-end designer finishes throughout the home. Ready for immediate occupancy. 4308 Sandorna View (Valen Italian Villa), 4,114 square feet, two-story residence, four bedrooms, three and a half baths, and a three-car garage. What’s special about the new Valen Italian Villa is that it backs in to an open greenbelt area, which means you can peer up the second-story balcony and take in the most amazing views of the hill country. Ready for immediate occupancy. 3933 Veneto Circle (Artisan Hill Country), 4,500 square feet, two-story residence, four bedrooms, five bathrooms, three-car garage. The open dining room is enhanced by a series of sun-filled windows and includes a view of a beautiful curved staircase. All bedrooms have their own private bath. You’ll also enjoy a cathedral-style ceiling while relaxing on the rear-covered porch. This is a model home. 3744 Good Night Trail (Bellwyn High Plains), 4,528 square feet, two-story residence, four bedrooms, four and a half baths, three-car garage. Breathe in the stunning views of the hill country and golf course from this home’s second-story balcony. This home also features a game room, home theatre, private guest suite, and private backyard. Select the link above and marvel at this gorgeous home. Ready for immediate occupancy. Travisso is a place to explore; a place to relax; a place to call home. With over-the-top amenities, fabulous home designs, natural beauty, and the backdrop of the Texas Hill Country, what’s not to love? Visit Travisso for more details or contact our information center at 512-243-8583.